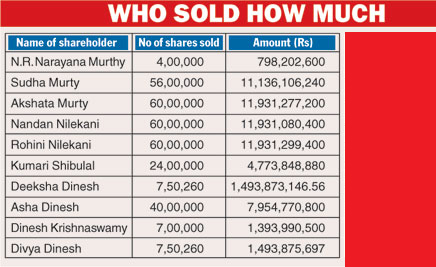 Families of four Infosys co-founders, including Narayana Murthy and Nandan Nilekani, on 8th Dec 2014 sold over $1 billion (Rs 6,484 crore) worth shares -- within months of all original promoters exiting the management and Vishal Sikka becoming the first outsider CEO. The shares have been sold at a time when the company has gone through a major governance and management restructuring. The last of the Infosys founders stepped down from the board in October this year, while former SAP executive Vishal Sikka has taken over as the CEO. This is the first time that someone other than the co-founders has been appointed as CEO.